SF 15 Session 6b - Anton Isaacs: The Koorie Men's Health Day - A community mental health service model for Aboriginal men - TheMHS Learning Network Inc.
Anton Isaacs designs and sets up mental health services for rural communities. 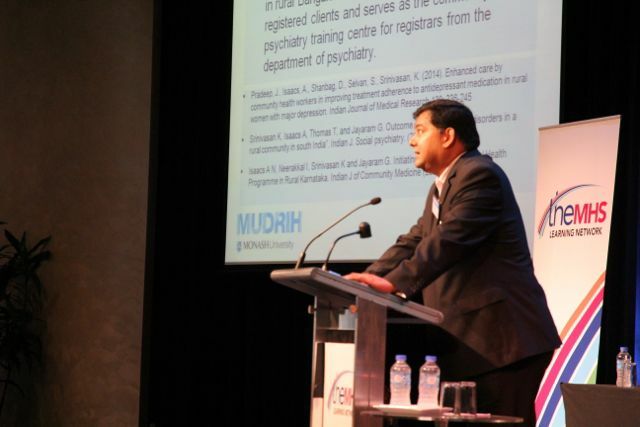 This presentation focused on his recent work on mental health in Aboriginal communities in Gippsland, Victoria. Research suggests that mental health problems are common in Aboriginal communities, particularly among men. However many Aboriginal men only seek help for health problems or distress when a crisis occurs or they are forced to. Anton stressed the reason for this is the stigma of mental illness within Aboriginal communities and also the stigma that western discourses about mental illness bring into Aboriginal communities’ understanding of distress. This stigma and shame prevents many men from seeking help until it is too late. Because these are small communities, anonymity is not an option as it is in city settings. Anton presented the Koorie Mens Health Day model. This program addressed many barriers preventing Aboriginal men accessing mental health facilities. The program had a major contribution from the local elders as well as a relaxing atmosphere situated within the community. This model transformed what was previously an anxious ordeal to a medical clinic into a enjoyable community event involving a barbecue and a combination of informal contact with health workers as well as health and mental health assessment. The Koorie Mens Health Day model seems to answer some of the concerns raised by Mick Adams yesterday – the need for more holistic service models that are owned and run by local communities and elders and which reduce barriers to access.